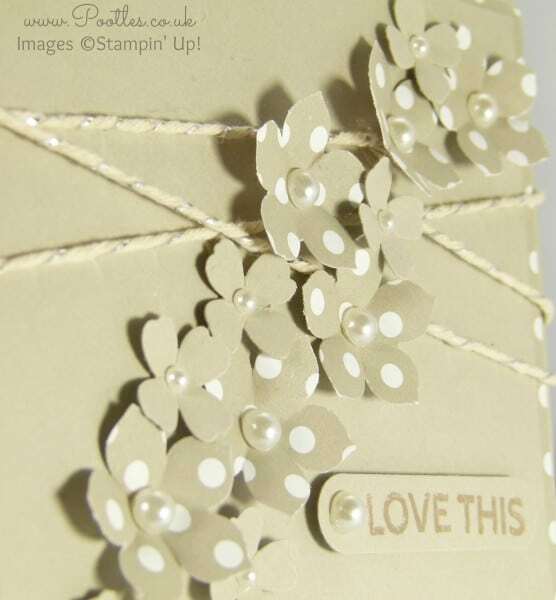 Spotty Cards using new Stampin’ Up! DSP! Pootles – Spotty Cards using new Stampin’ Up! DSP! New DSP! It has taken me 2 years to get used to the DSP we just retired out, and that’s partly I think because of those funny fan shapes and scallops. They weren’t the design I’d have chosen and I really missed the previous pack with it’s spots and scripted words. So imagine my surprise when unexpectedly the DSP stacks got changed this year instead of the predicted next year! But then the surprise turned to delight with the new patterns! We have it all! Spots, Stripes, Script and Flowers! And the Neutrals pack has had a change up too. There isn’t a white or vanilla option in there anymore, but instead, a soft silver and soft gold! Love, love, love! I was chatting to my husband on the phone the other evening when he was on night duty and quite absent mindedly created this card here. I’d got the Sahara Sand out in front of me when he called, and quite randomly I started punching out flowers and twisting bits of Metallic Baker’s Twine. 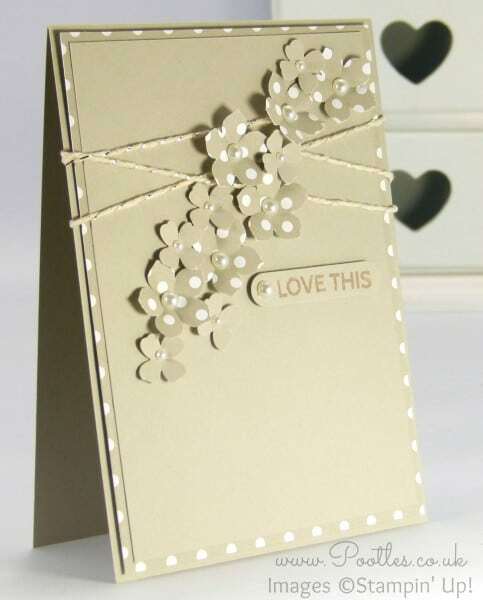 Rather me I think, and clearly I can create cards when not concentrating too! I do think though, that perhaps the wording would look better stamped in white ink rather than tone on tone…. Pretty card. I agree, I didn’t care for the scallops and fans. I like your tone-on-tone stamped sentiment Sam! It keeps the focus on the gorgeous spotty flowers! Lovely, as always! Always a fan of tone on tone but agree that the sentiment needs to “pop” a bit more. Love the simplicity, yet classy! I found that when I’m not certain what to do with the DSP that I buy and then sort of regret later, is to make it into the paper roses with that wonderful SU! rose die. then I attach them to skewers (sp?) and glue on some leaves cut out of green card stock and curled with my bone folder and I have a lovely bouquet of paper flowers – a perfect gift for an elderly person, or a way to decorate a package or a cupcake! Sam – your cards are always right on. Love, love, love them all. Love your tone on tone card. It is very subtle and absolutely georgeous! I may have to “adopt” your idea from you!